The ratio obtained when doing this comparison is known as the F-ratio. A one-way ANOVA can be seen as a regression model with a single categorical predictor. This predictor usually has two plus categories. A one-way ANOVA has a single factor with J levels. Each level corresponds to the groups in the independent measures design. As for all parametric tests the data need to be normally distributed (each groups data should be roughly normally distributed) for the F-statistic to be reliable. Each experimental condition should have roughly the same variance (i.e., homogeneity of variance), the observations (e.g., each group) should be independent, and the dependent variable should be measured on, at least, an interval scale. In the four examples in this tutorial we are going to use the dataset “PlantGrowth” that originally was available in R but can be downloaded using this link: PlantGrowth. In the first three examples we are going to use Pandas DataFrame. All three Python ANOVA examples below are using Pandas to load data from a CSV file. Note, we can also use Pandas read excel if we have our data in an Excel file (e.g., .xlsx). 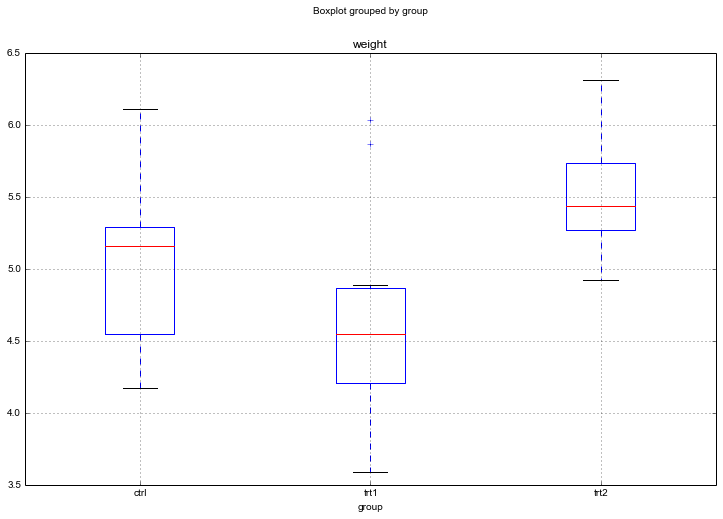 Judging by the Boxplot there are differences in the dried weight for the two treatments. However, easy to visually determine whether the treatments are different to the control group. We start with using SciPy and its method f_oneway from stats. However, if we want to calculate eta-squared we need to do some more computations. Thus, the next section will deal with how to calculate a one-way ANOVA using the Pandas DataFrame and Python code. A one-way ANOVA is quite easy to calculate so below I am going to show how to do it. First, we need to calculate the sum of squares between (SSbetween), sum of squares within (SSwithin), and sum of squares total (SSTotal). We start with calculating the Sum of Squares between. Sum of Squares Between is the variability due to interaction between the groups. Sometimes known as the Sum of Squares of the Model. Sum of Squares Total will be needed to calculate eta-squared later. This is the total variability in the data. Mean square between is the sum of squares within divided by degree of freedom between. To reject the null hypothesis we check if the obtained F-value is above the critical value for rejecting the null hypothesis. We could look it up in a F-value table based on the DFwithin and DFbetween. However, there is a method in SciPy for obtaining a p-value. The third method, using Statsmodels, is also easy. We start by using ordinary least squares method and then the anova_lm method. Also, if you are familiar with R-syntax. Statsmodels have a formula api where your model is very intuitively formulated. First, we import the api and the formula api. Second we, use ordinary least squares regression with our data. The object obtained is a fitted model that we later use with the anova_lm method to obtaine a ANOVA table. We can also use the method anova1way from the python package pyvttbl. This package also has a DataFrame method. We have to use this method instead of Pandas DataFrame to be able to carry out the one-way ANOVA. Note, Pyvttbl is old and outdated. It requires Numpy to be at most version 1.1.x or else you will run in to an error ( “unsupported operand type(s) for +: ‘float’ and ‘NoneType’”). This can, of course, be solved by downgrading Numpy (see my solution using a virtual environment Step-by-step guide for solving the Pyvttbl Float and NoneType error). We get a lot of more information using the anova1way method. Maybe of particular interest here is that we get results from a post-hoc test (i.e., Tukey HSD). Whereas the ANOVA only lets us know that there was a significant effect of treatment the post-hoc analysis reveal where this effect may be (between which groups). That is it! In this tutorial you learned 4 methods that let you carry out one-way ANOVAs using Python. There are, of course, other ways to deal with the tests between the groups (e.g., the post-hoc analysis). One could carry out Multiple Comparisons (e.g., t-tests between each group. Just remember to correct for familywise error!) or Planned Contrasts. In conclusion, doing ANOVAs in Python is pretty simple. Heck of a job there, it aboesutlly helps me out. Thank you for your effort, very clearly set. Error: new-line character seen in unquoted field – do you need to open the file in universal-newline mode? I cannot really answer your question since the error does not happen on my computer. I did find this: http://stackoverflow.com/questions/17315635/csv-new-line-character-seen-in-unquoted-field-error. Maybe you could test that and see if it works. If you solve your problem, or have already solved it, please let me know how. thanks for the great post. I wanted to offer an update to part 2 (python based ANOVA) for when the groups have different sample sizes. It just takes the division by n (element-wise) inside the outer sum in both cases. I tested this by comparing with the output from f_oneway and it seems to work. It should also generalize well to the case where n is the same for all groups. Thanks again for the write-up! thanks for your comment and thanks for the update! I’ll add this to the post (with a reference to your comment, of course). This looks really interesting! Will install this later today and play around with it. I might just add it to one of my posts listing useful Python packages. We’ll see! Maybe I’ll also update this post (or write a new one). I’ll send you an email, if I do.